Nirvana’s “Pennyroyal Tea” has a long and complex history. Named after a poisonous herb taken, usually unsuccessfully, to induce abortion, the song reportedly dates back to a 1990 four-track demo. The In Utero version was scheduled to be released as a single before Kurt Cobain’s death in April 1994. Everyone from Cobain’s widow Courtney Love, with Hole, to the Flaming Lips (to, um, Jared Leto) has covered it. Now, BuzzFeed points to a video of a Russian subway performer who sounds uncannily like Cobain, specifically in his solo MTV Unplugged in New York rendition of the brilliantly pained song. The Russian busker, Nikolay Petrovsky, didn’t surface out of nowhere, of course. 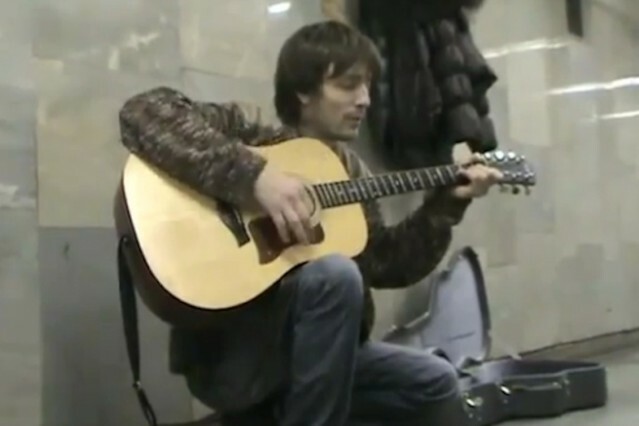 Russia’s Life News reported in December 2010 that Petrovksy lives in Novosibirsk, Siberia, is a self-taught musician, and doesn’t even speak English. Trained as a sailor, he reportedly doesn’t drink, smoke, or take drugs and has been singing in his hometown’s subway since at least 2004. He does acknowledge that sometimes his upstairs neighbors bang on the roof from above.